We are pleased to announce a special partnership with Bido Lito! for the April edition of their Social. We are bringing you three of Liverpools finest bands completely free of charge. The gig will take place at the Buyers Club on Thursday 21st April at 7.30pm, welcoming the likes of SUGARMEN, WE ARE CATCHERS and THE PROBES. After a highly productive 2015 with support slots for the likes of Blur and The Who, Sugarmen return to their home city for a headline slot prior to the release of their debut album. The band definitely stand out from the crowd with their high energy punk pop sound. With their debut single ‘Dirt’produced by Brian Jones of The Clash in Paul Weller’s Studio its clear that this band are one of the most exciting and breakthrough acts this year. We Are Catchers have also been busy recording at Paul Wellers Black Barn Studio for the follow up of the 2014 debut album. Described as ‘weaving the harmonic threads of the Wilson Brothers, Arthur Lee and Buffalo Springfield’ the We Are Catchers sound could easily have came about in 2016 or in 1966. 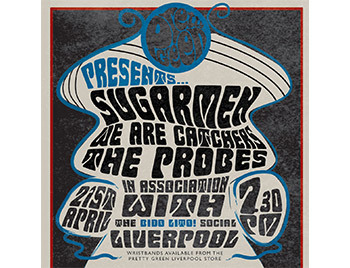 The Probes have been quickly winning admirers across Liverpool with their brand of atmospheric psychedelia. Definitely ones to watch. A limited number of FREE wristbands for the event will be available from the Pretty Green store from the 24th March. Join us in-store 24th March for a drink and Guest DJ between 6pm-8pm where the wristbands will be made available. Read more at: Bido Lito!